1. Medicine and the Environment in Shakespeare's England. 2. Food, Status and Knowledge: Attitudes to Diet in Early Modern England. 3. Illness among the Poor in Early Modern English Towns. 4. 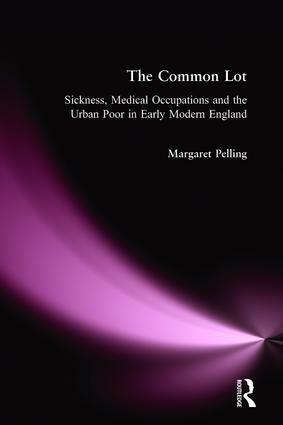 Healing the Sick Poor: Social Policy and Disability in Norwich 1550-1640. 5. Child Health as a Social Value in Early Modern England. 6. Old Age, Poverty and Disability in Early Modern Norwich: Work, Remarriage and Other Expedients. 7. Older Women: Household, Caring and Other Occupations in the Late Sixteenth-century Town. 8. Nurses and Nursekeepers: Problems of Identification in the Early Modern Period. 9. Occupational Diversity: Barber-surgeons and other Trades 1550-1640. 10. Trade or Profession? Medical Practice in Early Modern England.